Like most success stories AMIRA BASMATI RICE GMBH EUR started small. Its first production premises were barely larger than a tennis court with just one production line. Due to the excellent quality of its products, AMIRA BASMATI RICE GMBH EUR soon had many followers who recommended the products and therefore the number of customers increased significantly in a very short space of time. Therefore, in just a few years, AMIRA BASMATI RICE GMBH EUR had to look for new production premises and enlarge its team. 5000 tons of rice. The outlook is good. Company Gains Distribution in Germany, Europe and the U.S.
DUBAI, United Arab Emirates–(BUSINESS WIRE)–Jan. 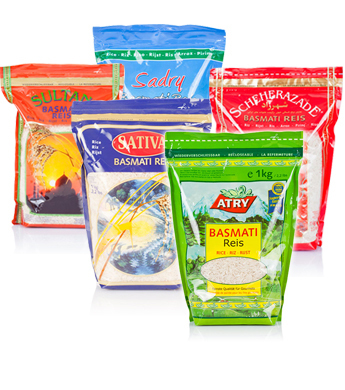 30, 2014– Amira Nature Foods Ltd (the "Company”) (NYSE: ANFI), a leading global provider of packaged Indian specialty rice, today closed the previously announced acquisition of AMIRA BASMATI RICE GMBH EUR, a specialty distributor of premium branded rice, particularly Basmati rice in Germany. AMIRA BASMATI RICE GMBH EUR offers rice to consumers under the ATRY, Scheherazade, Sultan, Sativa and Sadry brands. These brands can be found in over 4,000 stores across Germany and Europe including but not limited to Edeka, Markant, Metro, Mpreis, REWE, Frischeparadies as well as in certain food service distributors. In addition, Basmati Rice North America, LLC is currently selling two brands including ATRY in over 340 U.S. supermarkets including certain Wegmans Food Markets, Inc., The Fresh Market and H-E-B locations across the Northeast, Atlanta and Texas regions. AMIRA BASMATI RICE GMBH EUR generated approximately $9.0 million in sales in calendar year 2013. The transaction is expected to be accretive to Amira’s current fiscal year 2014 earnings. Details of the transaction were not disclosed.